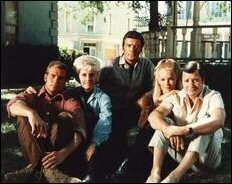 The Big Valley ran on ABC from 1965 to 1969. It was created by A.I. Bezzerides and Louis F. Edelman. The producer was Levy-Gardner-Laven. Associate producer Lou Morheim performed the same function on the 1960 film The Magnificent Seven. The memorable and stirring theme tune was composed by George Duning. Paul Henreid, of Casablanca fame, directed a number of episodes. Four Star Television produced the series. 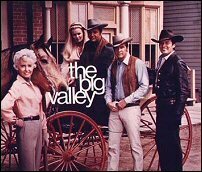 The TV series was based loosely on the Hill Ranch located at the western edge of Calaveras County, not far from Stockton (one episode places the Barkley Ranch a few hours ride from town while another has Jarrod riding past a Calaveras County sign on his way to the TV series' ranch). The Hill Ranch existed from 1855 until 1931, exceeded 1,000 acres, and had the Mokelumne River running through it. Today, the location of the ranch is covered by the waters of Lake Camanche. A California State historical marker standing at Camanche South Shore Park mentions the historic ranch. * Victoria Barkley, portrayed by Barbara Stanwyck, was the widowed matriarch of the wealthy, influential Barkley family living in 19th century Stockton in California's central valley. Victoria Barkley was the undisputed master of the Barkley ranch. In fact, Stanwyck's refusal to portray Barkley as fragile was controversial at the time. Barkley's husband, Thomas, had been killed several years prior in the universe of the series. * Jarrod Thomas Barkely, the eldest son, was a respected attorney. Richard Long played the role as the more intelligent and calmer of the Barkley sons. While Jarrod preferred the law to settle disputes, he was known to resort to frontier justice and violence when necessary. Jarrod was briefly married in one episode only to see his new wife killed off almost immediately. * Hot-tempered younger son Nick Barkley, who managed the family ranch, was portrayed by Peter Breck. Nick was well-known for his leather vests and large black hat. He was also notorious for getting into fist fights. At times, he would fight with his brothers as well. * Linda Evans played Audra, Victoria's only daughter. Much like her mother, Audra was no wall flower and often was involved in daring stunts and did not ride side-saddled. * Heath Barkley was the illegitimate son of Victoria's late husband. Lee Majors portrayed Heath, who gradually gained acceptance from the rest of the Barkley clan. Although Nick initially detested Heath, they eventually became close. In fact, Nick eventually became closer to Heath than Jarrod. * The youngest Barkley son was Eugene, a medical student studying at Berkeley, played by Charles Briles. He was seen sporadically in only five first season episodes and then written out. Only once was his name ever mentioned again. Eugene Barkley is an example of the Chuck Cunningham Syndrome. * The regular cast was rounded out by Napoleon Whiting, as Silas, the Barkleys' majordomo.